Sick kids often will pass on taking medicine, even if they know it will make them feel better. Pills can be hard for them to swallow, and liquid medicine can taste bad. Pills are particularly onerous for children. A recent study found that 50 percent of children have problems swallowing standard-size pills. Here is some advice I often give to parents to help their child take medicine. It’s easier to teach younger children to swallow pills before they have the chance to develop a fear of them. Children who are afraid of taking pills fear they will choke on the pill. If this is your child, you can remind him or her that their throat is capable of handling much larger things, like food. It’s best to teach your children to take pills early, like when they are 4 or 5 years old — before they develop a fear of swallowing things. Waiting until they are 8 or 9 may be too late. Kids tend to mimic their parents when it comes to the ways in which they act and speak – and taking pills is no different. Showing your children how to swallow pills and emphasizing that it is not hard to do will ease their fears. It’s important to take an upbeat, positive approach. When your child is ready, place the pill around your child’s teeth, or toward the back of the tongue, and adjust the chin so the head is tilted back. Tell them to pretend the pill is a piece of food and to swallow it. Often children will put a pill in their mouth but don’t swallow it right away. Then the pill coating dissolves and they experience a horrible taste, so they spit out the pill. This results in reluctance to try taking a pill again. Unfortunately, many liquid medicines don’t taste great either. One time-honored solution is to mask the task of medicine with food. Try ice cream or applesauce or any thick food in which the pill can hide. Or try giving your kids a popsicle first, which puts a good flavor in the mouth and numbs the tongue, too. Also, when the tongue is cold, it can’t sense flavor as well. But what to do if the medicine is in liquid form? If you don’t have a popsicle handy, you can put a spoon in the freezer for a few minutes, place it on your child’s tongue, then remove the spoon and give your child the medicine. 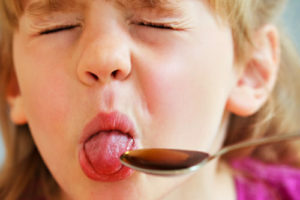 The cold spoon on the tongue does the same thing as a popsicle – it lessens your child’s ability to taste and numbs it a bit. 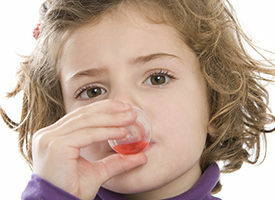 After your child swallows the liquid medicine, give him or her something to drink. That will drown out the taste. You also can ask for a syringe at your local pharmacy and use it to inject liquid medicine into a peanut butter cup-type candy. The peanut butter and chocolate will disguise the taste without affecting the medicine. Almost any food that has a thick consistency will work to mask medicine. For some kids, orange juice will do the trick, especially if it’s the pulpy kind of juice. But it can be anything with a strong flavor that your child likes. Gelatin, however, is not a good choice – it’s not as flavorful or cold as other foods.